Within three (3) business days after NBMTM approves a candidate’s exam application, the candidate will receive an email notification when the Authorization to Test (ATT) is ready. It is, therefore, important for the candidate to keep their email address current with NBMTM. The ATT letter can only be accessed in the candidate’s myNBMTM account. The ATT letter authorizes the candidate to schedule and to take the certification exam. It will include details on how to schedule the exam, as well as information on how to reschedule or cancel an exam, if necessary. If a candidate has been approved for testing accommodations, the ATT letter will contain instructions on how to proceed. The ATT letter is active for 180 days. If the candidate does not take the exam within this time period, the ATT letter will expire and the candidate will have to request to reissue the ATT letter for an additional 180 days. The ATT letter can be reissued as many times as necessary during the one-year exam application period, with the understanding that in order to successfully reissue a letter, the candidate must cancel any previously scheduled exam appointments. Once a candidate submits a request to reissue an ATT letter, the original ATT letter is voided. The candidate may no longer test on the original ATT letter. If an exam application is more than one year old, the ATT letter can no longer be reissued; a new exam application and full application fee MUST be submitted. The fee to reissue an ATT letter is $100 for each reissue and will vary depending on the candidate’s specific circumstances. It is the candidate’s responsibility to check their email and MyNBMTM account to see whether the ATT letter has been sent to them. Candidates can view and print a copy of their current ATT letter from their myNBMTM account. After the ATT letter has been received, candidates can schedule their testing appointment directly from their myNBMTM portal. Candidates SHOULD NOT contact NBMTM until they have received the ATT letter. All exams must be scheduled a minimum of 7 days in advance of the appointment date. The NBMTM support the intent of and comply with the Americans with Disabilities Act (ADA). The Board will take steps reasonably necessary to make certification accessible to persons with disabilities covered under the ADA. Special testing arrangements may be made upon receipt of the Application, examination fee, and a completed and signed Request for Special Needs Accommodations Form, available from www.nbmtm.org or by calling our office at (202) 489-0506. This Form must be uploaded with the online application at least 2 weeks before the testing period begins. Please use this Form if you need to bring a service dog, medicine, food or beverages needed for a medical condition with you to the testing area. Information supplied on the Request for Special Accommodations Form will only be used to determine the need for special accommodations and will be kept confidential. 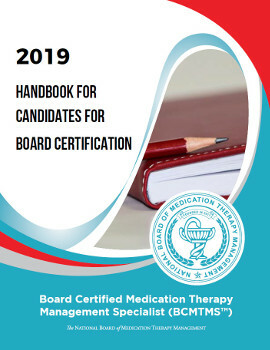 The National Board of Medication Therapy Management (NBMTM) is committed to assuring that aggrieved candidates for certification have access to an appeal process concerning the administration of the certification examination. 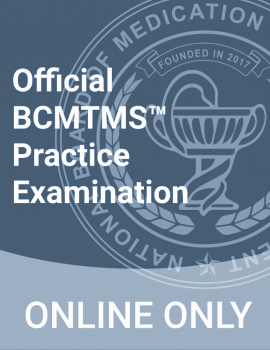 The NBMTM will allow a candidate to appeal an examination if the candidate feels the actions of the NBMTM, with regard to any part of the examination, constitute unequal application of the regulations and requirements or standards; unwarranted discrimination, prejudice or unfairness; or improper conduct of the examination. The NBMTM will not consider appeals based on the content of an examination, the sufficiency or accuracy of answers, scoring of the examination, scoring of answers to individual questions, and/or the determination of the minimum passing score.